College DownTime: League of Legends - Buff Vladimir! Well the community has been wanting it for quite a while, and Phreak has rumored they are reading the posts. Just about every refresh on LoL's forums will show a post with numerous examples as to how Vladimir is severely underpowered and overlooked by other Ability Power based champions: Will Riot buff him in the next few patches? Lane: Vladmir main source of damage is his Transfusion (Q) and Tides of Bloods (E), both of which have very low range, in the laning phase. Compared to other mages his early game is very weak. His Q is on a High CD so, so he can't spam it, and his E doesn't do nearly as much damage to be noticeable,unless you spam it until 4 stacks,in which case your going to be low on health most of the time. All the other mages have better poke,farm,etc. The only thing that vlad can do better is escaping ganks with his Sanguine Pool (W), or as I call it the trollpool. Teamfight: This really depend on whos farmed more, but it doesn't even matter really when we're talking about Vlad. He will usually just be an AP off tank. He's not like Brand or Annie where they burst, then come back and do it again. He's like an sustained kind of fighter. The only reason why he is still able to teamfight is his pool, which keeps him alive in teamfights. He has to get so close to use his skills, so most of the time you will be like Q>E>R>W>Q>E then die. His teamfight is only good if you can ult atleast 3 of them and stay in teamfights for a while. If you can't stay in a teamfight, then your pretty much a burden to your team. Usually AP casters will do more damage than you in teamfights,since there so short. Utility: This isn't even a contest. 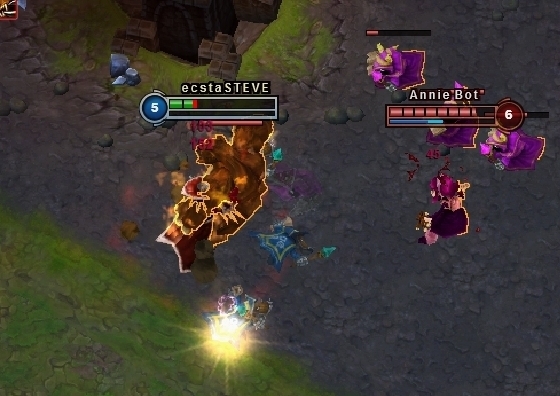 Annie, and Orianna have a AoE stun, Brand has a stun,which isn't much, but makes up for it with his damage. What does Vladmir have? He has a slow. Now this is good if you can slow 5 of them, but unless you have a good team right as soon you come up from your pool, you will get focused and die. Vlad doesn't offer as much utility as other mages. Survivability: There's not much to say about Vlad's survivability. Since Vlad has to get upclose to do some damage his survivability is really low. For a person that doesn't bulid tanky, to have to get up close to do damage you can bet your going to get focus the moment you get up from your pool, or when your walking into the teamfight. We can only hope so, here's to you fellow Vlad players. This entry was posted on October 4, 2009 at 12:14 pm, and is filed under cheap, games, League of Legends . Follow any responses to this post through RSS. You can leave a response, or trackback from your own site. Hopefully the company listens to its customers, otherwise they'll continue to have constant bickering. "Make Jax OP and release more Teemo skins!" I've been trying to find the "Meanwhile at Riot HQ" comics, those are hilarious but hard to find. I'm going to have to start playing League of Legends, I keep seeing it everywhere but have never had the time!